Always a Witch is the second book in the ‘Witch’ series by Carolyn MacCullough. 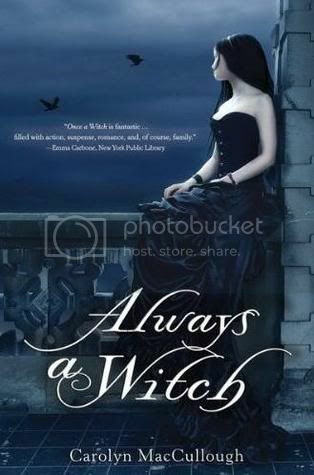 I absolutely loved reading Once a Witch, and couldn’t wait to get my hands on Always a Witch. This series is so very awesome; it’s definitely one of my favorite series. In the book, we follow Tamsin and her hunky boyfriend, Gabriel, as they travel back in time to save the Greene Family from destruction at the hands of the evil Knight Family. Tamsin is just an awesome character. I love her. She's very courageous, and will do whatever it takes to make sure her family is safe. I love her family as well, they are so great. Gabriel is very swoon-worthy. He is totally devoted to Tam, and you can tell her cares for her deeply. I missed him a lot in the first half of the book though. Even the villains are well thought out and very interesting. This book is very fast paced, and the storyline is engrossing. Mrs. MacCullough's writing definitely kept me interested in the story, and I had a really hard time putting the book down. Overall, this book was great. This series is great! I love the characters, I love the storyline. I love it all, and I can’t wait to read the next book in the series. Don't you love how the titles go together. Once A Witch, Always a Witch. I think I may have to read this series NOW! It sounds excellent. I really like when the sequel is just as good as the first. I love Tamsin and Gabriel's relationship. I think Tamsin is such a strong person and a great heroine. I love the time travel and historical elements of this one; different from the first but just as good. I've heard such good things about this book and series, I'm really going to have to read it and soon! Yay! Can't wait to read this one. I adored Once a Witch too and am so excited for more Tamsin and Gabriel. Though I'm disappointed he's missing in the first half, but I'm looking forward to everything else about this one. Thanks for the review Christy! I love books that have time travel, definitely going to have to read this series. I love these two books as well! ALWAYS A WITCH is so final at the end and so I wasn't sure if there would be any more books in this series. I asked Carolyn MacCullough either on Facebook or Twitter about it and she said at this time, these two books are IT for the series. It's super sad, but she did tie up everything at the end of AAW, so I'm not sure what else she could do. I still haven't read Once a Witch, but I really want to! I'm a huge fan of witchy books, so I'd probably love it. Glad you enjoyed the sequel though, it's good to see the series is a great one!